The organ of Saint Luke's Episcopal Church. When Saint Luke’s congregation began worshiping in its new nave on All Saints Day in 1970, the dream of a fine pipe organ to lead the congregation’s song seemed like just that – a dream. Money was tight, and the church’s aged electronic had to suffice for a couple of years, when the organist and choirmaster at that time was engaged to build a pipe organ which was completed in 1973. The instrument which resulted, while serviceable, had nothing of the visual grandeur and elegance one usually associates with pipe organs, many tonal modifications had to be made almost immediately, and the organ was a maintenance nightmare. By 1995, although everyone had more or less gotten used to the inelegant assemblage of leaning pipes, plywood and PVC conduits in the rear of the nave, it was clear that something had to be done. The room’s lively acoustics are an ideal home for the best pipe organ possible, and the 1973 instrument, fondly (?) known as “Augustus”, was just not up to the task. 1995 saw the formation of an organ committee, whose task at that time was simply to plan and carry out the rebuilding of the existing instrument. Under the guidance of consultant Geoffrey Simon and after meetings with various builders, it became increasingly clear that rebuilding was not the wisest course of action. About the same time, under the visionary leadership of then-rector Neal Goldsborough, the parish acknowledged the need to pay off the existing mortgage and install an elevator, as well as to provide for future musical needs. A successful capital campaign culminating in the May 30, 1999 consecration of the building provided funds to accomplish these goals, and the wise decision was made to sell Augustus and obtain an entirely new instrument. The original plans of the nave included provisions for a mechanical-action instrument, one in which the linkage between keys, pedals and pipes is made by wooden “trackers” rather than electrical connections. This type of action is not only sensitive to the player but historically very durable, often lasting for centuries. Committee members visited organs in the Washington area and elsewhere; a trip to Chicago brought about a visit to an instrument by Pieter Visser which led to his choice as builder. The new instrument, dubbed “Cecilia”, arrived in Alexandria on November 18, 2001, and was heard in church for the first time on December 9. 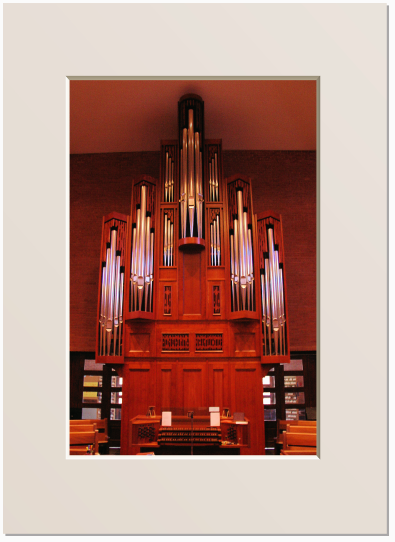 The dedication recital was performed on May 5, 2002 by Mark Laubach, organist at St. Stephen’s Pro-Cathedral in Wilkes-Barre, PA and 1984 winner of the American Guild of Organists National Young Artists’ Competition in Organ Performance.